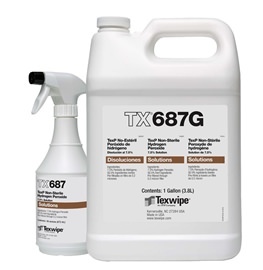 Texwipe’s® Hydrogen Peroxide cleaning solutions are developed for use within cleaning rotation cycles to maintain a clean environment and reduce Volatile Organic Carbon (VOC) concerns. Solutions are available in a 7.5% RTU concentration and are available in a handy 16 oz spray bottle for small areas and 1-gallon bottle for large areas. Individually lot coded for ease of traceability and quality control. Labeled in three languages (English, Spanish, French).